The Panasonic WV-CS954 has been discontinued. No direct replacement is available. Panasonic WV-CS954, an all-in-one color surveillance dome camera unit featuring Super Dynamic III technology. 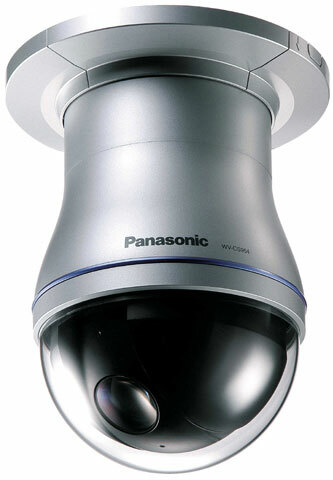 The Super Dynamic III dome camera WV-CS954 from Panasonic power packed with 30X optical zoom offers dramatic enhancement in subject identification. With its 10X digital zoom, a total zoom capability of 300X it is capable of identifying any distant subject. WV-CS954's pixel based 128X Dynamic Range works superbly even when the contrast changes from scene to scene. Area free natural contrast image correction ensures accurate reproduction, whatever the subject. Horizontal resolution is significantly higher, 540 lines (typical) in color or 570 lines in B/W. Images stay clear and sharp in lighting as low as 0.5 lux in and 0.04 lux in black and white. Adaptive Digital Noise Reduction eliminates streaking from objects such as headlights.